Baby Tigers Have Blue Eyes! Did you know the tiger’s mystical golden eyes are a trait that only adults possess? Babies are born with blue eyes, which open when they are about 10 days old. Want more tiger trivia? Check out this list I found with 50 Fun Facts About Tigers. To learn more about tiger conservation, look at the work that World Wildlife Fund did in 2010, the Chinese Year of the Tiger. WWF rallied efforts to end tiger poaching, curb demand for tiger parts, protect and connect tiger habitat, build political will and marshal support to save critically endangered wild tiger populations. But much more remains to be done. To lend a hand, take a look at 10 Ways to Save Tigers. The official Year of the Tiger may have passed, but until the tiger’s future is secure, every year should be dedicated to safeguarding their welfare. P.S. Interesting in seeing wild tigers in their natural habitat? Consider a trip to Wild India. 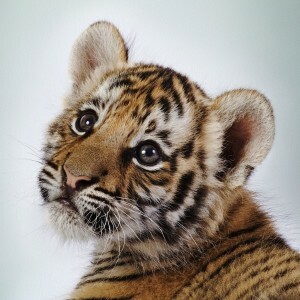 OMG I LOVE BABY TIGERS!!! I have blue eyes too! I have this as a screen saver. Stop the slaughter of these beautiful animals before they are all gone from the planet. OmG! I love tigers and this ones adorable. I LIKE THAT TIGER IT IS SO CUTE!!!!!!!!!!!!!!!!!!!!!!!!! !